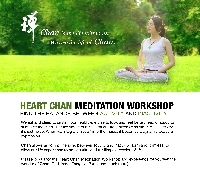 Join Graduate Student Wellness Project and Heart Chan for a free meditation workshop. In this workshop, you will learn breathing techniques for deep relaxation, cultivation of 'Qi', basics of Heart Chan meditation, and Qi-Gong exercise to strengthen the body. No prior meditation experience is required. Chan meditation is a tradition in China later being passed to Japan known as Zen. Heart Chan practice is along the lineage of Chinese "Chan" that can be traced back to Shaolin Temple in China over 1,500 years ago, where Master Bodhidharma integrated and harmonized various spiritual practices and led practitioners to clarity, truth, fulfillment, and inner peace. Although it is traditionally viewed as part of Buddhism, Heart Chan is suitable for people of any religion or creed as its true essence surpasses languages or traditions. Please wear comfortable clothes, and bring a yoga mat if you have one. Please contact heartchan.berkeley@gmail.com for any questions.